Back in October, I did a post with my first attempts at getting some CGA games running on an Apple composite monitor that I’d just picked up. I sort of got this to work on a Tandy 1000 with composite colours being produced. Just not the right colours since the Tandy’s aren’t really compatible. I’d been expecting this and the intention was to use an original CGA card instead, except at this point I noticed that my CGA card was far too large to fit into the Tandy’s case. I therefore needed a suitable PC to try it out with. The next post where I got this working properly was supposed to follow shortly after but as ever with these old machines, it wasn’t that simple. This is the CGA card I’m intending to use. It’s a full length giant of a card with an 8 bit ISA interface. ISA was the original PC expansion port interface before PCI Express, AGP, PCI, Vesa and all the others. PC’s still came with ISA slots into the Pentium era but my options with this card are more limited. With the advent of 286’s the 8 bit ISA interface was expanded with a second slot to make the bus 16 bits. As a rule, this was entirely backwards compatible except my CGA card predates the 16 bit slot and doesn’t leave a gap for the extra connector on the motherboard. In short, I need an 8 bit slot if this thing is ever going to work which limited my options. 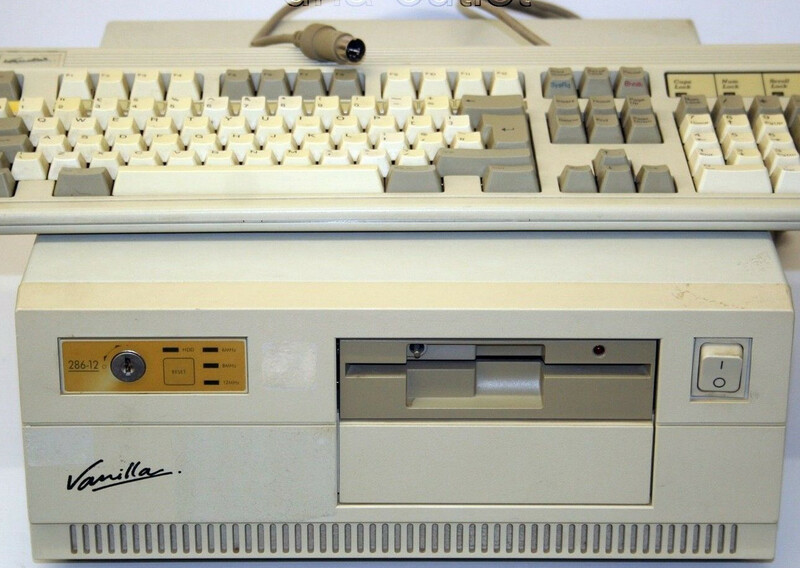 So with that in mind, I bought myself the above Vanilla 286 PC. OId PC’s have started to get a bit expensive and I no doubt paid more than I should but a machine that has been refurbed, tested and comes with a guarantee is worth a bit with a PC of this age. At any rate, it all worked perfectly in every respect except the minor factor that as soon as I tried to use composite out, I could only get monochrome. Having tried everything I could think of, I wasn’t sure whether it was the PC or the graphics card since I’d never used the CGA card before this. 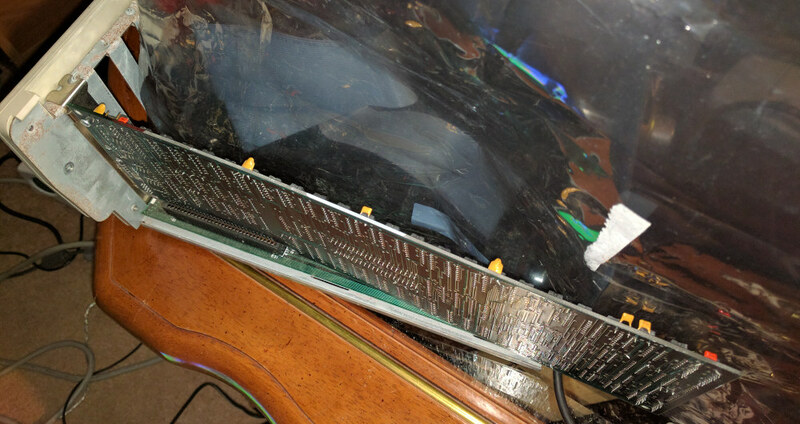 It occurred to me that given how long it was, there was enough flex in the CGA card that I could fit it into my Tandy if I bent it around the side of the case and I insulated it against the edge of the metal case with an antistatic bag. I really don’t recommend trying this at home but it did give me a means of testing it. Sure enough, it worked perfectly as shown in Ultima 2 above. Ultima 2 was one of the better composite games on the Tandy but comparing this to the screenshots from the last post, there is still a big difference. 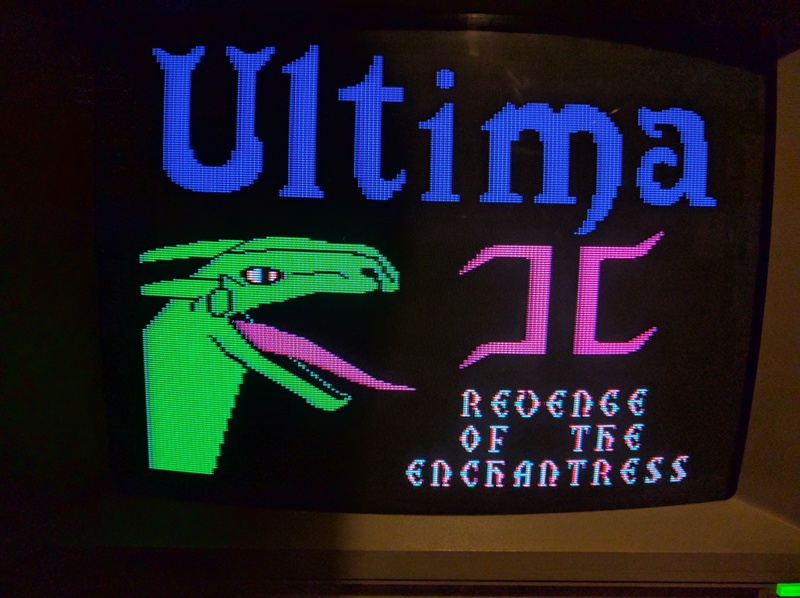 The blue Ultima text and green dragon more or less merged into one colour using the Tandy but are clearly defined here. In theory, I could have left it at this and just used my Tandy but there is no way I’m going to torture my one and only CGA card like that. It makes me wince just looking at the photo above. From my limited understanding, the CGA card can be told to run in either monochrome or colour by a bit that is stored somewhere in memory. None of the BIOS settings helped me out here though and I came to the conclusion that this PC may simply be hardcoded to only do monochrome. 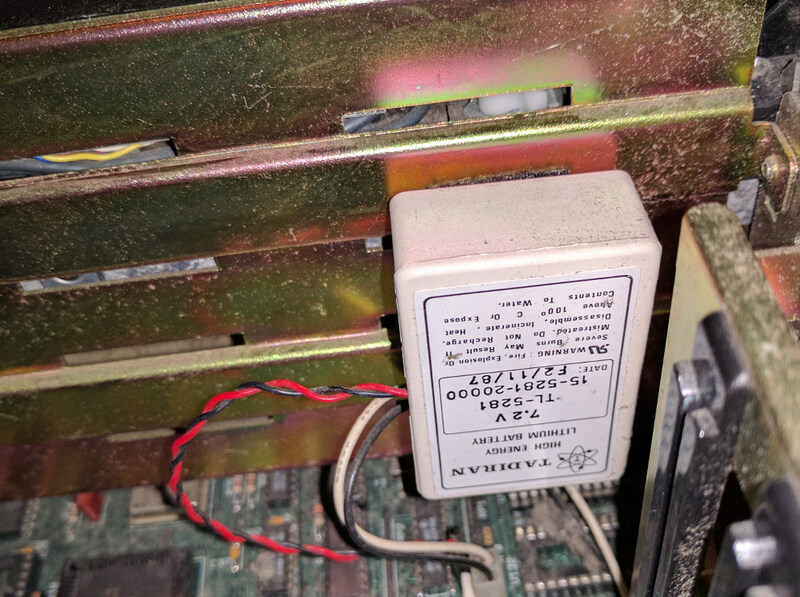 The other alternative is that there was an adjustable trim switch on the motherboard of a genuine IBM for CGA timings which was entirely missing from this Vanilla PC. Whatever the cause I couldn’t get it to work. These early PC clones were rarely 100% compatible so I gave in and sent it back for a refund. I’d not looked at trying again until earlier this week when having finally got over the post flood house insurance bill, I felt like I could spare the cash to try again with another machine. The one I picked up was a Televideo Telecat-286. This cost more than the Vanilla PC but had the bonus of coming with a working hard disk. For a supposedly tested machine, this thing was truly filthy inside to the extent that there is no way on earth I’d have tried switching it on without cleaning it out first. I’ve spared you the photos of 30 years worth of decaying clumps of dust and hair. Underneath everything still appeared solid at any rate with no bulging capacitors or the like. I’m not sure if weight is an indication of build quality but this is the single heaviest PC I’ve ever owned. I wondered what exactly was weighing that much until I opened it up and saw the man-size power supply taking up about 1/3 of the case. This thing was full of expansion cards which I didn’t strictly need . The big one on the left is a monumentally large modem. 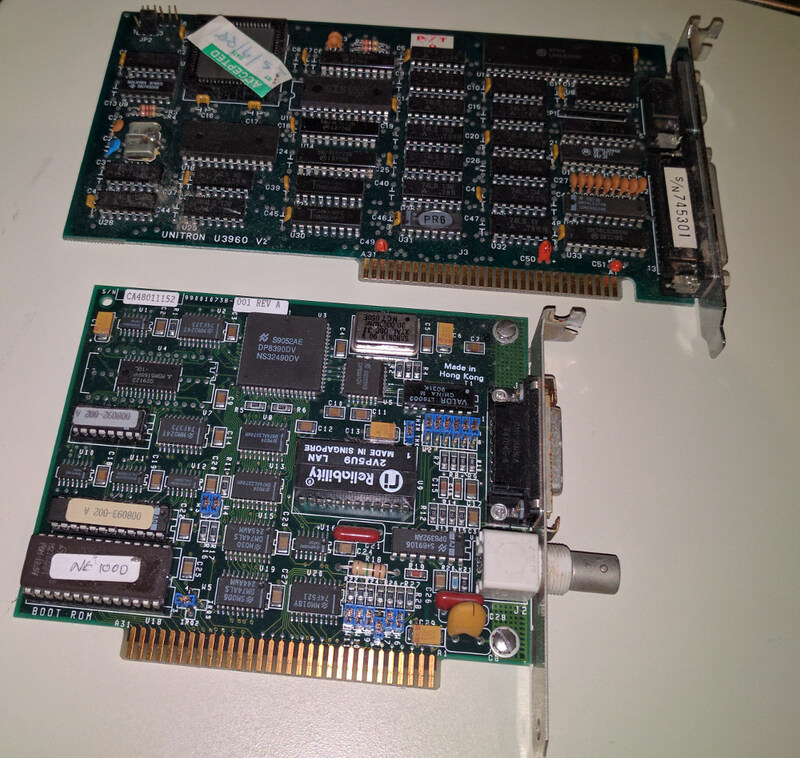 As for the other two, the bottom one is a network card and the other must be a CGA or EGA graphics card at a guess but I’m not 100% certain. 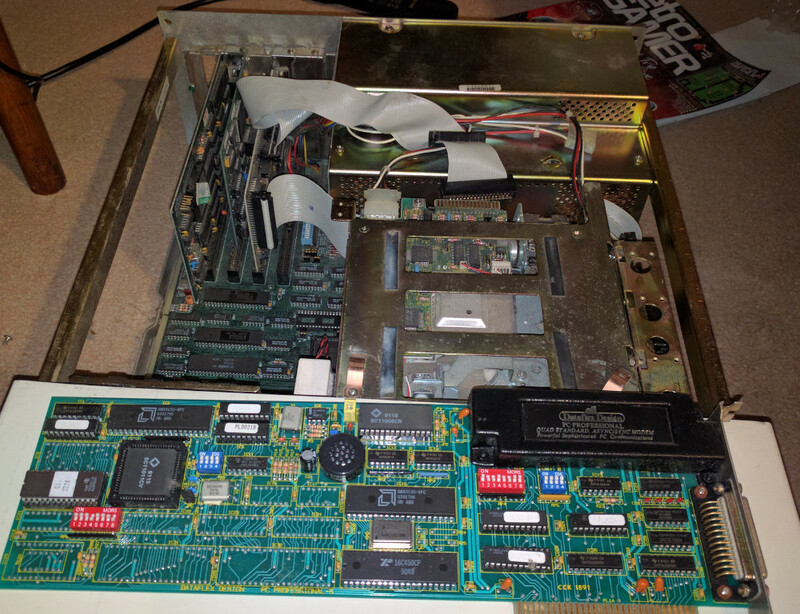 I slotted my CGA card in to one of the freed up slots and then worked on getting the PC to start up. After being initially alarmed at the turbine like noise produced by the PSU fan, I ultimately decided it was supposed to sound like that and I’d just forgotten how noisy PC’s used to be. It got as far as attempting to boot up but with none of the drive lights flashing couldn’t find a system disk. All these clone machines are different and since I have no manual and couldn’t find one on the web, I was stuck with trial and error. After a lot of fiddling around, I spotted that the floppy drive did work but was connected to B instead of A and since the BIOS was at default values the drive wasn’t detected. This got me to a DOS prompt but with no hard drive. I ignored this for now and tried to get the composite CGA working since that was the whole point of this exercise. At the first attempt, I managed to get some composite colour but only in a thin band with most of the screen remaining black and white. A bit of searching later and I found that like a genuine IBM, this motherboard does have a small variable resistor for CGA timing located at one end of the motherboard. It’s the small round orange thing in the photo above. A tiny tweak on this with a screwdriver and my graphics suddenly sprung into full colour. You may remember the day glow colours I got when trying King’s Quest 2 on the Tandy in composite. 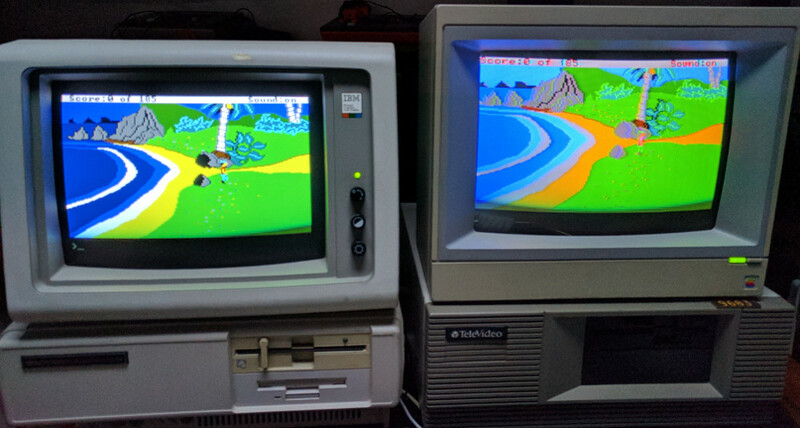 This time I actually got the correct colours which are not all that dissimilar to the 16 colour Tandy graphics on the left. The image is far less sharp in composite and this probably isn’t the best way to play these Sierra games but for the games not supporting Tandy graphics, it’s a massive improvement over the usual CGA palette. I still hadn’t got the hard disk working which was a bit of a learning curve. This machine is using a surprisingly modern 670Mb IDE drive, which allegedly had Windows 98 on it at some point if I can believe whoever wrote on it. I seriously doubt this PC ever ran Windows 98 so I assume this has come from another machine. The drive wasn’t being detected in DOS and I had no idea how to set it up. Aside from an array of unlabeled dip switches on the motherboard (standard in this era), this PC does have something resembling a BIOS except you apparently have to run a setup program from the DOS prompt to set the values rather than holding a key on startup. Much Googling later, I gave in trying to find that setup program but did come across something called gsetup.exe which is a universal BIOS setup program for 286/386 machines. As luck would have it, this was mostly compatible with my machine. I was only allowed to pick from 19 predefined hard disk types, the largest of which was 120Mb. I really didn’t expect this to work but the drive formatted 120Mb and I’ve been able to get this thing booting up without the floppy drive. I can live with the missing 550Mb. For the software I’ve got in mind for this machine, 120Mb will be plenty. Something I haven’t done yet is swap out the CMOS battery meaning I have to go through the whole setup process every time I switch the machine on. 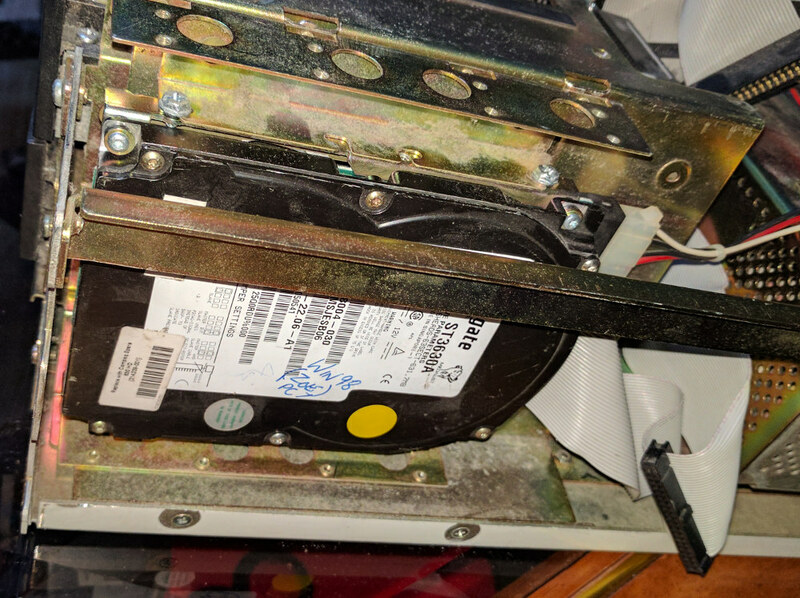 I’d usually expect to see a little CR2032 battery on a motherboard but this has a sizable Lithium battery stuck on the side of the drive bay. This is the same voltage as lots of remote control car batteries so I’ve ordered one of them which I’ll replace it with when it arrives. 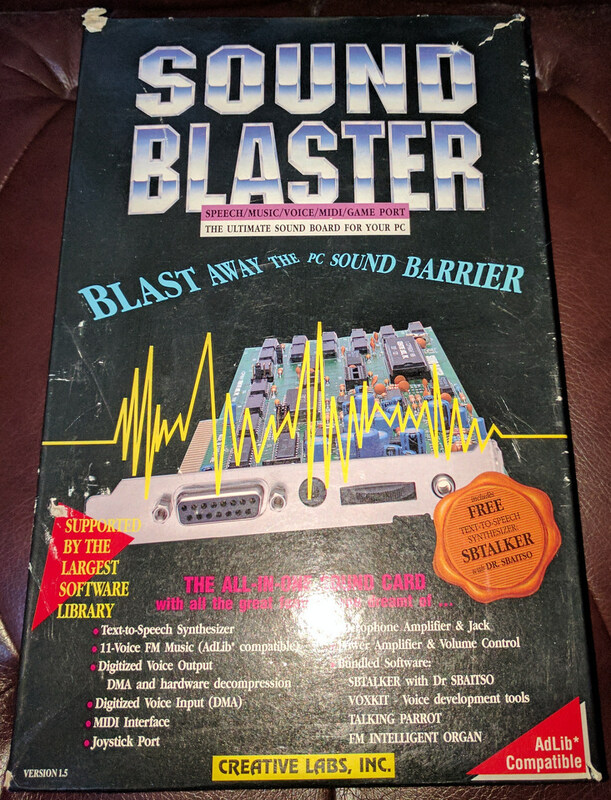 One last job was to install my first ever sound card which I’ve still got nearly 30 years later. I’ve sold or thrown away nearly every bit of hardware from that era but for some reason this got kept so I may as well make use of it now rather than just having the box on a shelf. I’ve still got to set up the hard disk with a proper installation of DOS but 6 months after I started, I’m nearly there at last. I’ve been curious about composite CGA ever since I played my first PC games back in the 80’s. I fully intend to dig out a few of those of those relics next week and see what they look like with some extra colours. 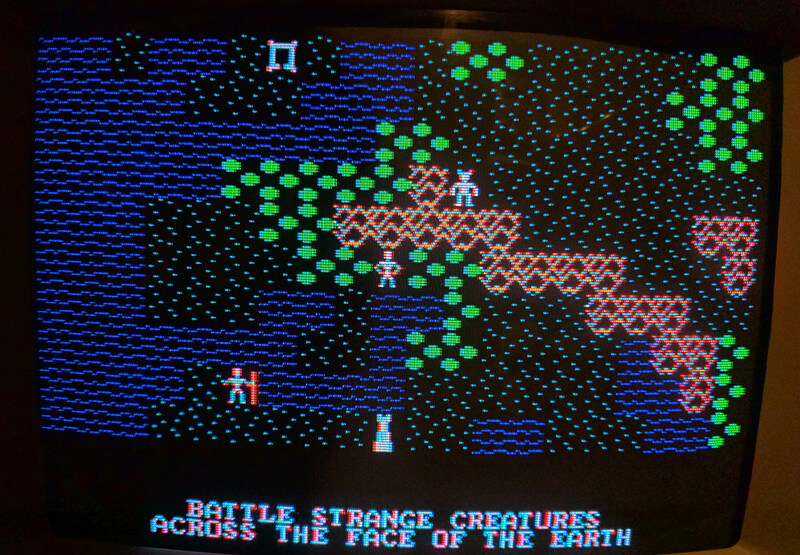 This entry was posted in Off Topic and tagged 286, COMPOSITE CGA by Pix. Bookmark the permalink.